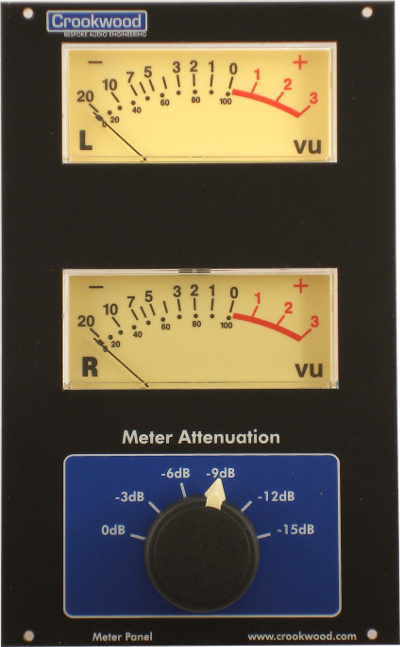 A large, accurate, stereo VU meter with versatile input attenuator for mounting next to your Crookwood console or controller control panels. Or anywhere else! The Crookwood Control Panel VU meter is designed to physically match our mastering consoles and monitor controllers, but can be used with any audio device. This excellent large stereo VU meter has a built in attenuator, so no matter how hot your mix or stem is, the VU s will work perfectly. Unlike the VUs placed on your gear, these VU meters are precision VU s that conform to BS6840:part 17 1991 & IEC268-17:1990, and the attenuator lets them work with signals up to +22dBu. 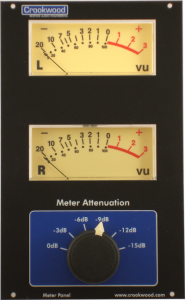 The combination of real VU meters and attenuator make this meter a superb addition to any studio, giving you a real sense of music levels and dynamics. Stepped, balanced attenuator offers attenuation of 3, 6, 9, 12 & 15 dB. £295 + VAT, contact us for a price in your currency – Available now!